Our	Duluth apartment community offers the ideal blend of luxury & convenience. Beautifully landscaped grounds, modern amenities and enjoyable community events define a distinctive living experience at The Eclipse. Select from one and two-bedroom apartment homes that feature stainless steel kitchen appliances, custom dark cabinetry, contemporary lighting and fixtures, granite style countertops, full-size washer/dryer connections and private patios with additional storage. Come home to a resort-style salt water pool and sundeck, fitness center, modern clubhouse with WiFi cafe, and fully-equipped outdoor kitchen with fireplace and grill. Get to know your neighbors at events such as Screen on the Green and our weekly Coffee Corner planned by our dedicated staff. Located near I-85, The Eclipse offers quick access to downtown Atlanta plus local shopping and entertainment off of Satellite Boulevard. 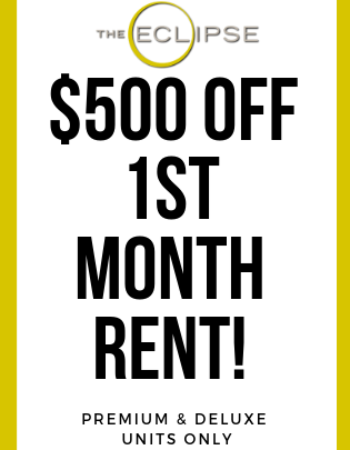 Call to speak with a leasing consultant to ask about current specials on select floor plans.